Location: Saint-Péray, in the Ardèche departement of France (Rhone-Alpes Region). Notes: Château de Crussol is a medieval fortress from the early twelfth century, located in the municipality of Saint-Péray in the Ardèche region in Auvergne-Rhône-Alpes. The mountain is occupied since Roman times, where a temple was built to honor Mars. A first fortified complex was built to the south during the fifth century but abandoned a few centuries later to the current site, to the north. The first castle, probably built in the tenth century was a wooden construction. After burning, it was rebuilt in limestone in the twelfth century by a lord named Gerald Bastet, to control the path of existing communication along the Rhone. At the end of the fifteenth century, a marriage unites family Crussol family Uzes. The castle was abandoned for that of Uzes, more comfortable. Religious wars give it back some appeal since it took and burned repeatedly by the various belligerents. It is definitely razed during the seventeenth century. October 3, 1855, a mine fire in the quarry under the castle causes the destruction of part of the building. The castle is the subject of a registration as a historic monument since May 31, 1927. In 1952, lightning destroyed part of the dungeon. The town of Guilherand-Granges bought the ruins in 1984, but the site is located in the municipality of Saint-Péray. The Rhône-Crussol community of municipalities working to rehabilitate the site. Today we can see a beautiful advanced renovations. Every early summer, a festival is held for two days at the site, with concerts, entertainment and pageants. 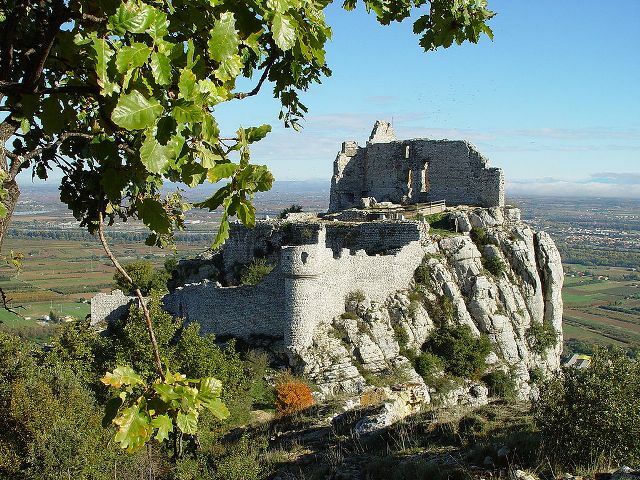 The castle ruins and the rock of Crussol are among 18 natural sites of the Ardèche On the night of February 2, 2014, a major landslide key part of the mountain Crussol.